Indians are taking up the banner of “giving back”. Many more might join if incentives to do so could be enhanced. India recently created a new agency to oversee its growing development aid commitments – the Indian Agency for Partnership in Development. Over the past few years, there has been much discussion around India’s role as belonging to one of three categories: an international aid recipient, an aid donor, or a middle-income country deserving of some sort of graduation from aid programs. At the same time, there is another similar discussion that warrants attention—that of the growing role of philanthropy in India for India. There is a palpable perception of economic unease in India, as illustrated by a recent Gallup poll. It discovered that an increasing number of Indian citizens consider themselves to be “suffering.” Gallup had asked them to classify themselves as either “thriving,” “struggling,” or “suffering,” and between 2011-2012 there was an increase from 24% to 31% in the latter category. Given the global economic downturn and India's own diminishing growth, it is not an altogether surprising finding. But given India’s increasing number of “super-rich”, a vastly expanded middle class, and the massive government handouts that are supposed to target those in need, this is indeed a somber surprise. Just before the Gallup survey was released, Bain & Company published their third annual report on philanthropy trends in India. In it, there is promising news. Last year, the report highlighted the fact that charitable giving had increased by 50% between 2006-2011. This year it notes that within the growing population of India’s wealthy there is “an especially strong commitment to ‘giving back'” to India. Given that international aid and domestic government assistance can realistically only fill a portion of India’s vast needs, these new philanthropists can begin to address the existing gaps. That India’s wealthy are stepping up to give in new ways is a welcome change. It is important to note here that giving in itself is not new to India. But there is a noticeable shift underway in how Indians are giving – new donors, new intermediaries, and a new trend in targeting aid towards the greater social good; beyond one’s household help and religious institutions. One encouraging finding from the report is that a majority of those polled are considered novice philanthropists and under the age of 40. They also report an interest in venture philanthropy – a sustained method of giving over time, to the same organization as it grows and reaches set targets. This group of new philanthropists is committed to giving more, and as they become more seasoned, can significantly increase the community’s quality of life and drive a level of professionalism in the philanthropic eco-system that is not yet widespread. Thousands of NGOs and charities will have to compete to attract this admittedly small but growing group of young, wealthy, socially conscious donors. Many “want to adopt Western practices that favor more structured ways of giving, with a focus on outcomes,” notes the report. It also advises that “this growth [in philanthropy] is contingent on organizations demonstrating impact and raising confidence in the returns on giving.” India’s nascent philanthropic eco-system will have to become more transparent, accountable and outcome-oriented. Over 350 million people in India live below the poverty line (less than $1.25/day). One-third of the world’s malnourished and stunted children live in India, with nearly 50% of children under 5 considered “stunted due to chronic under nutrition,” a situation Prime Minister Singh called a national shame. The government is often unable to provide essential services such as primary school education and basic healthcare to a large swathe of the population. Philanthropists have a tremendous opportunity to help bridge these gaps in services. Today, India’s philanthropic donations amount to just 0.6% of GDP. While this may surpass other BRICS economies, these efforts are insufficient given the scale of current challenges. It may take decades to reach the current level of giving in developed economies (2.2% of GDP in the U.S.), but if the goal is to decrease chronic poverty the government must incentivize giving. If there is one thing that India’s economic reforms in the early 1990s proved, it is that when its private sector is unleashed it flourishes and succeeds. The same should be done for the philanthropic eco-system. The Indian government should take steps to empower philanthropists which, by permitting philanthropy to thrive, would ease the burden on themselves. Philanthropists’ most consistent complaints are of an NGO sector lacking in capacity and professionalism, little access to capital and mentors, and tax laws that don’t incentivize giving. The first two complaints are being addressed by a growing group of dynamic young professionals. But the Indian government is the only actor who can amend the code to incentivize greater giving. Policy changes could facilitate greater private donations which in the long-term would decrease people's dependence on government handouts. Donors in India currently receive a tax break on 50% of their donations or 10 percent of their taxable income, whichever is lower. They do receive 100% deductions for some giving, but the eligible organizations, as listed in India’s Income Tax Act of 1961, are very few. A blanket 100% deduction on contributions to registered charitable organizations would incentivize more donors, as it does elsewhere. It has long been recognized that the level of philanthropy in India is not proportional to the accumulation of wealth in the country, although in recent years there have been some notable exceptions to this by leading industrialists and entrepreneurs. It is clear that many Indians are taking up the banner of “giving back,” and many more might likely join if the giving environment could be enhanced. This would surely have an impact on those most in need, and on India’s overall economic outlook. Persis Khambatta is currently a fellow with the Wadhwani Chair in U.S.-India Policy Studies at CSIS. She was previously a program officer for the Asia Foundation, and has lived in Mumbai, India. 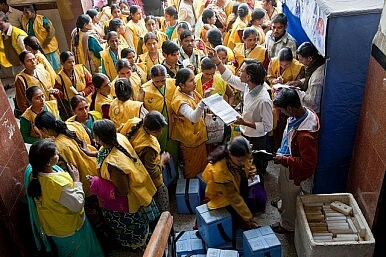 India’s National Food Security Bill is aimed at offering subsidized food for hundreds of millions. Will it pass? India and Oligarchic CapitalismIndia’s Deadliest EpidemicThe Bricks of Wrath: India’s Migrant WorkersIndia’s Food Security ProblemFood Bill Stumbling?